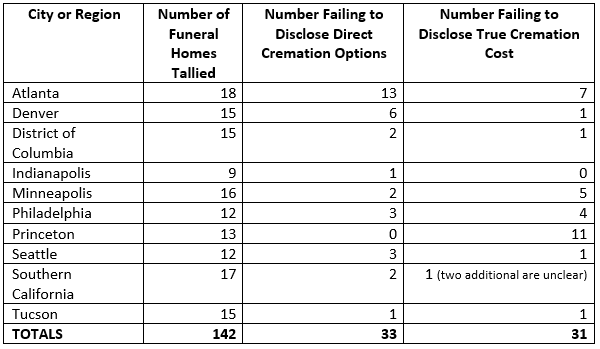 Washington DC/Burlington VT — Today, the Funeral Consumers Alliance and the Consumer Federation of America released a survey of 142 representative funeral homes showing that more than one-fifth (23%) fail to tell consumers about their options for simple cremations, in violation of the Federal Trade Commission’s “Funeral Rule,” which requires specified price disclosures on a list and verbally (but not on a website). These anti-consumer practices affect hundreds of thousands of American families each year. The rate of cremation equaled the rate of burial for the first time in 2015. About 1.6 million American families will choose cremation for a loved one who dies this year. The new report supplements an October 2015 survey that found only 25 percent of funeral homes fully disclosed their prices online. In July of 2016, Funeral Consumers Alliance (FCA) and the Consumer Federation of America (CFA) formally requested that the FTC re-open the Funeral Rule for amendments, including a new requirement for funeral homes to publish their complete prices on their websites. Today, FCA and CFA are calling on the FTC to ensure that funeral homes obey existing law and also expand this law to also eliminate egregious practices, such as the failure of some homes to include the cost of the cremation itself in the price of cremation services. Researchers also visited the websites of these same funeral homes. In every metropolitan region, prices for the same Direct Cremation varied so widely it is clear how important consistent and accurate price disclosures are for consumer families. “This extreme price variation provides compelling evidence of the need for effective price disclosure,” noted Stephen Brobeck, CFA’s Executive Director. “Accurate price disclosure on all funeral home websites would certainly restrain those homes that clearly are gouging consumers today,” he added. While all surveyed funeral homes listed a price for Direct Cremation, more than 20 percent failed to list prices and options for consumers who buy an outside casket or container. Most often, these funeral homes offered one price with the container included, directly contradicting the Funeral Rule’s requirement to “unbundle” merchandise and services. Remarkably, the report also found that 31 of 142 funeral homes (22 percent) are advertising a price for Direct Cremation that does not include the cremation of the body. Many funeral homes use third-party crematories. These typically charge $250 to $400 to cremate a body, a cost that is passed along to consumers. But it is inherently deceptive to list a Direct Cremation service for, say, $1,500, and then surprise the client family with an additional charge of many hundreds of dollars for the very service they thought they were buying. The Funeral Rule does not require funeral homes to include what are known as “cash advance” charges within their Direct Cremation fee. Instead, funeral homes may list them separately, and there is no requirement to list them directly next to the advertised price for Direct Cremation. This led to an unintended consequence: Too many funeral homes omit this fee from their advertised charge, making Direct Cremation prices seem artificially low. As part of our request to the FTC to amend the Funeral Rule, FCA and CFA urge the Commission to close this loophole. FCA is nonprofit organization founded in 1963 to protect the consumer’s right to choose a meaningful and affordable funeral. More than 70 local educational groups are included in FCA’s national federation. CFA is a nonprofit association of more than 250 pro-consumer groups that was established in 1968 to advance the consumer interest through research, advocacy, and education.